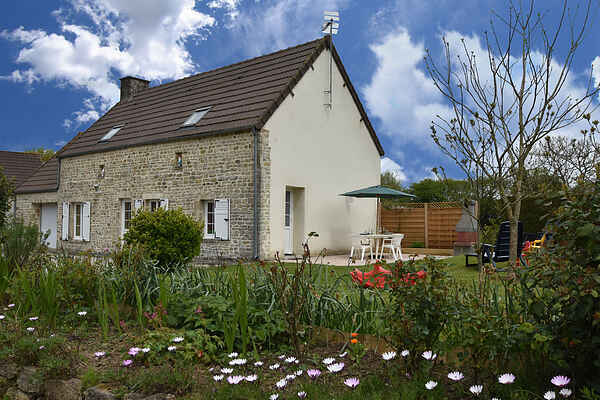 This lovely rural holiday home lies just outside the village of Gourbesville, in the middle of the beautiful Cotentin region, and only 20km from Utah Beach. You can sit in the beautiful garden while the kids enjoy playing on the swing, or with their playhouse and other toys. For hikes in woody surroundings, go to Saint-Sauveur-le-Vicomte (14 km), where an old railwayline has been turned into a hiking and bike trail. You can also canoe or kayak on the Douve river. Visit beautiful Valognes (15 km) with its 18th century Hôtel de Beaumont and gorgeous gardens. An 18-holes golf course at Fontenay-sur-Mer (15 km). Baker and grocers at Gourbesville (3 km). Go visit Sainte-Mère-Eglise too (8 km). Famous for the paratrooper John Steele who in 1944 was left hanging on the church tower during his landing. In Sainte-Marie-du-Mont (17 km) you can visit the occupation museum and work on your knowledge of WO II and the battle of Normandy. You can of course also enjoy a nice day on the broad beaches. There are several options to kite and wind surf or to parasail.